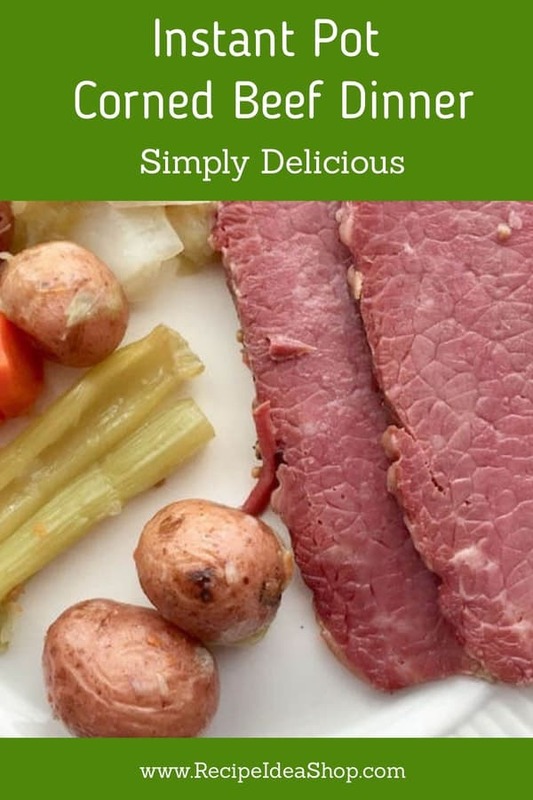 Instant Pot Corned Beef Dinner is my new favorite way to make Corned Beef and Cabbage. Perfect, juicy meat. Wonderfully flavored vegetables. Super easy one-pot meal. Instant Pot Corned Beef Dinner. Perfect! Hi. It’s Lois, with another way to make your Corned Beef and Cabbage Dinner. 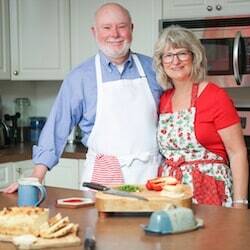 The Instant Pot. Super easy, but it does take awhile. I used the pressure cooker setting on the Instant Pot, cooking the meat first for 90 minutes. This means it really takes about 2 hours, because it takes about 1/2 hour to build up the steam and pressure before the timer starts to time. Then I used the quick release method to release the steam (follow the directions of your pot’s manufacturer). Removed the meat to a platter, covered it with foil and stuck it in a 200-degree oven to keep it warm while I made the vegetables. I dumped all the veggies (including the cabbage, which I wouldn’t do again because its gets wimpy, although it was tasty) into the pot. I set the pressure cooker time for 5 minutes and let the vegetables steam. Again, it takes about 1/2 hour to get the steam and pressure where it needs to be before it starts timing. So, all told, it took 2 hours and 35 minutes to cook. 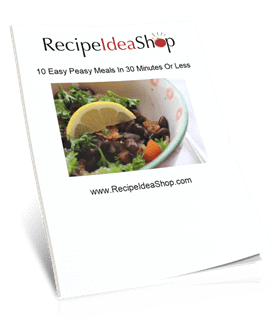 About 20 minutes were hands on to prepare everything before cooking, so count on a bit less than 3 hours for this recipe. But you can sit down, have a glass of wine or two, play some games with the kids, or dance a jig while you wait. No fussing! The meat was tender and delicious, vegetables perfectly cooked (except for the cabbage), and everything had that wonderful salty, corned beef taste. This is certainly a delicious way to make corned beef, Instant Pot Corned Beef Dinner. Only next time I will follow my own advice, and steam the cabbage separately! Tender, savory meal in one pot supper. Put the corned beef brisket into the Instant Pot with the fat side up. You can use the rack in the bottom if you want, but it is not necessary. Add the water, garlic and package of spices and juices that came with the brisket. Close the top and set the Instant Pot to Pressure Cook, with a time of 90 minutes. When the meat is finished cooking, release the steam using the instant release method (see your manual for this). Open the pot, and remove the meat to a platter. Cover it with foil and put it in a 200 degree oven until the vegetables are done cooking in the next phase of the recipe. While the meat is cooking, prepare the vegetables. Wash the potatoes and set them aside in a bowl large enough to fit all the vegetables. Wash and cut the celery into 2-inch chunks. Put them in the bowl with the potatoes. Peel the carrots and cut off the ends. Wash them. Then cut them into 2-inch chunks and put them with the other vegetables. Peel the onions, cut them into 4-6 chunks and put them in the bowl, awaiting cooking. Peel the outside layers of the cabbage off if they look wilted. Wash the cabbage. Cut it into pie-sized wedges (about 8), removing the center core. Now you have a choice. You can put the cabbage with the other vegetables and cook it at the same time as the others. OR you can steam it separately on top of the stove for about 20 minutes until crisp tender. If you put it in the Instant Pot with the other veggies, the cabbage will get soft, but it will still be tasty. 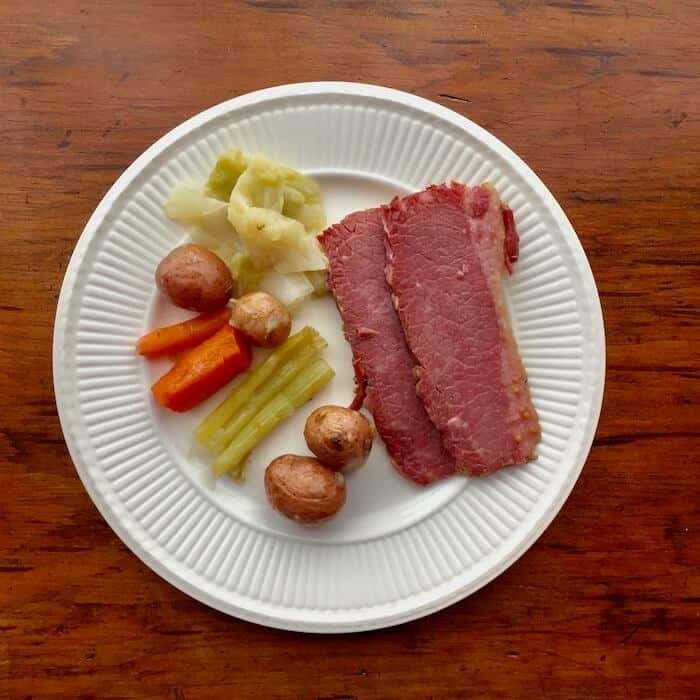 When the corned beef is done cooking, and you remove it to a platter, put the vegetables into the Instant Pot, close the top, set it to Pressure Cook and set the timer to 5 minutes. When the vegetables finish cooking, do a quick release of the steam, and remove the vegetables to a serving dish. Take the meat out of the oven, slice it in thin strips (against the grain), and serve with the vegetables. IP Corned Beef Dinner Nutrition. Each serving is 1/6 the recipe.